Alex Thacker will introduce his newly commissioned piece for this concert in a free pre-concert talk at 6.45pm. Doors open at 6.30pm. From the 16th century to a new commission, this exploration of the dialogue between Heaven and Earth is inspired by Lassus’ Easter hymn Aurora lucis rutilat. The earliest piece is Palestrina’s beautiful Missa Papae Marcelli, perhaps one of the most famous and historically important examples of polyphony. Peteris Vasks’ Plainscapes is a vocalise masterpiece accompanied by solo violin and cello that creates a haunting impression of the Baltic landscape, whilst Alec Roth’s Stargazer is a playful and expressive rumination on the stars and how humans view outer space. The world premiere of Let Earth and Heaven Combine, commissioned from the young, award-winning composer Alexander Thacker, completes this sumptuous and sometimes meditative programme. 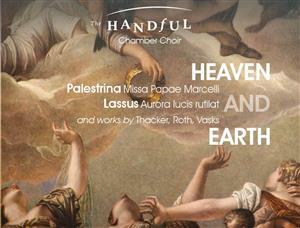 The Handful has enjoyed an enviable reputation as one of the most exciting, vibrant and adventurous chamber choirs in and around Bath. Founded in 2002 as A Handful of Singers, the choir started out as a small group of experienced singers. Since then the choir has grown both in size, to 26 singers, and in stature. With Tomos Watkins at the helm, The Handful has entered a new phase as a forward-looking choir, always enthralling audiences with its fine sound and imaginative programming, and always seeking to leave them captivated.